I made a flyer last week for a show I set up at the end of the month. Now I've just gotta start plastering them around town and in relevant households. I used to be really excellent at flyering, having thankfully found the delicate balance between covering every necessary spot and not overwhelming/straight-up spamming the public's eye. I feel like I've fallen off the wagon a little bit since, but will give it a shot anyways. If you spot a telephone pole absolutely wallpapered with these, know I have lost my mind and duly apologize. Also, find me and take away my staplegun. 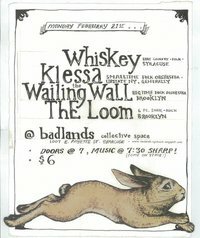 This show is the first time my band klessa is playing New Paltz in around a year. 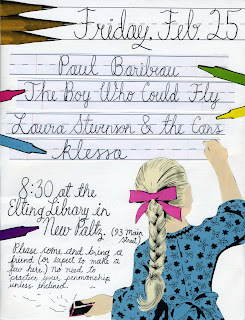 In fact, the last show we played was in last April in Syracuse with Laura Stevenson & The Cans. So, we're sort of coming full circle with this one. I'm really excited about this show, which is also with Paul Baribeau and The Boy Who Could Fly. It should be a really good night! 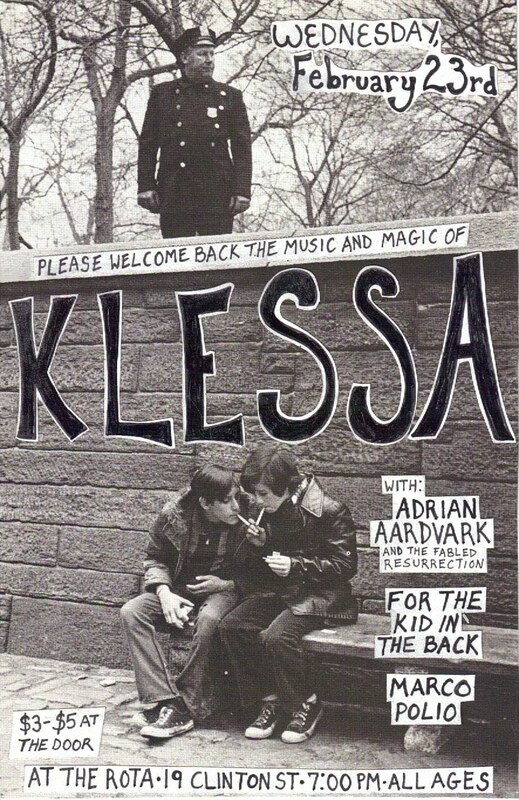 Prior to this show, klessa is doing a small tour. Our geographical locations put a hiatus on us for most of last year. Matt moved to rural Ohio to do a natural building internship, and Cheryl moved to Rochester. Upon reuniting in Canada for New Year's, we realized that we really could be playing again if we wanted to, as Matt had re-located to Syracuse. We got motivated, had a practice in Rochester, and planned a 5 date tour. I miss playing music in this project and with these people so much, so I am really happy to be able to spend 5 days doing this. Here are the shows, maybe you can come to one! Once I get some more motivation I'm going to try and craft a bandcamp page for us, as myspace has truly sunk itself into the depths of "completely unusable and aesthetically enraging/offensive." 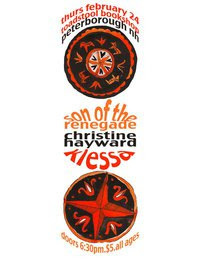 We have a CD that we'll be bringing around with us on tour, and it can also be purchased locally in New Paltz (at Rhino Records, Jack's Rhythms, and Inquiring Minds Bookstore), and online: on the myspace until I get myself together.